In November 2017, SMU’s Central University Libraries uploaded 294 items into CUL Digital Collections. 19 pamphlets and leaflets, ca. 1870-1910, into the Texas: Photographs, Manuscripts, and Imprints digital collection as part of the TexTreasures FY2018 grant program, sponsored by the Texas State Library and Archives Commission and funded by the Institute of Museum and Library Services. Witherspoon & Gough, attorneys-at-law and real estate dealers: we handle the choice lands of Deaf Smith County: exclusive agents for Western Union Land Company lands and Hereford town property, 1900s, DeGolyer Library, SMU. This month’s selection of historic Texas promotional material is comprised of pamphlets encouraging people from around the world to immigrate to Texas. Among these is a pamphlet by William G. Kingsbury, a traveling dentist who became the Texas Commissioner of Immigration and settled in San Antonio after encouraging hundreds of people to relocate to Texas. A similar 1886 leaflet from the German-American Land Company advertises lots for sale in the Bee County town of Papalote, northwest of Corpus Christi, where Hawaiian and Iowan settlers moved to experiment with growing orange orchards. Other promotional material originates from companies based in Chicago, such as the Southern Texas Colonization Company, The American Land Company, and The Capitol Freehold Land and Investment Company. These businesses sold land to Northern farmers and filled the pamphlets published for this purpose with agricultural information such as descriptions of Texas’s soils, climate, and lists of which crops and animals fared the best in warmer weather. Other pamphlets and leaflets originate from boards of trade in cities including Waco, San Antonio, and Dallas. These pamphlets extol the virtues of each city, their natural resources, businesses, suitability for family life, and each city’s potential for future growth. An item of special interest originates from the Hereford real estate firm of Witherspoon and Gough, owned in part by Lysius Gough, a teenage runaway who grew up to become a judge, was elected mayor of Hereford in 1906, and became known for his writing, including a book of cowboy-themed verse entitled Western Travels and Other Rhymes. Other documents include railroad company literature targeted at tourists and immigrants, describing sights to be seen and cities to pass through along lines operated by the Missouri, Kansas, and Texas Railway Company and the Missouri Pacific Railway Company. These works emphasize illustrations, descriptions of buildings and natural scenery, maps of railroad routes, and summaries of historic events. Many of these descriptions promote hunting and fishing in the Texas wilderness, enjoying the mild climate that was deemed as beneficial for sufferers of respiratory illnesses, and the contrast of climates and natural scenery that passengers could see when traveling through other states on the way to Denison, San Antonio, or other cities in Texas. American school children at play, ca. 1946-1947, DeGolyer Library, SMU. 16 film negatives, 1933-1948, from assorted negative series in the Robert Yarnall Richie Photograph Collection. 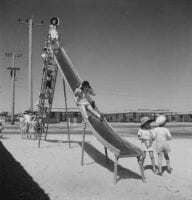 These images include children playing at the Ras Tanura compound of the Saudi Aramco company and aerial views of two of Jessie May Woolworth Donauhe’s mansions. 5 stereographs, ca. 1859-1860, depicting West Point, New York, including a hand-colored stereograph of Break-Neck Mountain along the Hudson River and a stereograph of the Cadet’s encampment at the United States Military Academy. 7 postcards, ca. 1904-1939, from the George W. Cook Dallas/Texas Image Collection, featuring images of Confederate monuments, the Hillcrest State Bank, and an advertisement for Drinkwater Flour. 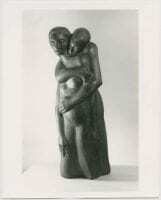 [Carved Wild Cherry Wood Sculpture, ”Conceived”], 1952 (artwork), 1962 (photograph), Bywaters Special Collections, SMU. 144 images from the Octavio Medellin Art Work and Papers collection. Of these items, 139 images, ca. 1981-1983, are related to Octavio Medellin’s “The Promised Land” installation. The images comprise in-process shots of the copper and brass sculpture being formed at Medellin’s studio in Bandera, Texas, as well as the installation of the piece at Temple Emanu-El in Dallas for its dedication in 1983, as a gift to Rabbi Levi A. Olan on his 75th birthday. Several images feature Medellin apprentices David Hickman and Tomas Bustos assisting with the installation at Temple Emanu-El, along with additional former Medellin students who were on-site for the installation. Also added were two images that relate to Octavio Medellin’s “Conceived” sculpture. Both images are of the wild cherry wood sculpture and were taken by Jan Boles, College of Idaho archivist, in the early 1950s. Finally, 3 images related to Octavio Medellin’s “The Bather” sculpture were uploaded. The three images are of the monkeypod wood sculpture, taken from three different angles, by Jan Boles as well. 9 drawings, 1881-1904, from the Collection of Baldwin Locomotive Works Records, including a detail drawing for a smoke stack for the Vladicaucase Railway in Russia and an erecting card drawing for the Western Railroad of Cuba, among other national and international railroads. [Women Washing Laundry, Mexico], ca. 1882, DeGolyer Library, SMU. 1 Baldwin Locomotive roster from the Collection of Baldwin Locomotive Works Records. The roster covers 5,000 construction numbers, listing the company’s work for the years 1907 through 1910. 4 images by A.S. Addis, ca. 1882, from the Collection of Photographs of Mexico, including a photograph of a group of women doing laundry on the banks of a stream or river in Mexico. Shiprock looking west- 3 pm, no date, Bywaters Special Collections, SMU. 89 sketches by Jerry Bywaters, done primarily in the 1930s and 1940s, from the Jerry Bywaters Collection on Art of the Southwest. The sketches depict a wide array of scenes and settings, from theater audiences and orchestra conductors to the mountains and flora of the Southwest. Examples include a watercolor sketch of Shiprock, a monadnock in New Mexico, and a blue ink sketch of live oaks in West Texas. This entry was posted in aerial photographs, Civil War, Dallas, Robert Yarnall Richie, stereographs, Texas artists, Texas photographs, Texas Regionalism, TexTreasures2018, U.S. West. Bookmark the permalink.